Obama or Romney: Who Wins Tomorrow? Four years ago, the polls were clear, and the only question was whether a last gasp of racism would change voters’ minds in the booth. This year it’s all a lot less clear, but we can still see the general shape of how the election will play out. Let’s start with the basics: The presidential election happens state-by-state. Each state has a certain number of electoral votes (equal to the number of its congressmen plus two for its senators). So in general, more populous states count for more, but the less populous states’ votes are still disproportionate to their population. Every state, no matter how small, gets at least 3 votes. The District of Columbia also gets 3 votes. The fuhgeddabowdit states. In most states, the election won’t be close, and we might as well chalk them up now. Nate’s model gives at least a 99.5% chance that the following states will go to a particular candidate. Probably most of them will be called as soon as the polls close. Stranger-things-have-happened-but states. These are the 95% states. Occasionally somebody from the underdog’s camp will claim they’re going to pull an upset, and if you have too much money to spend you might even advertise (like Romney in Pennsylvania). But don’t hold your breath. The only way the underdog wins these states is with such a national landslide that the state won’t matter. Obama: Michigan (16), New Mexico (5), Oregon (7), Pennsylvania (20) — subtotal 48; running total 236. Romney: Arizona (11), Montana (3) — subtotal 14; running total 190. Battleground Row. Now it starts to get interesting: Obama at 236 is approaching the magic 270. Romney at 190 has very little room for failure. This is where Nate makes an astute observation: Each state may have its own independent election, but the state elections are not independent in a statistical sense. If, say, Obama takes North Carolina (where Nate gives him only a 22.8% chance), that probably means a national wave is building that will easily give him Wisconsin (94.5% chance). It would be a very strange world indeed if Obama took North Carolina and lost Wisconsin. So it makes sense to line up all the states by their Obama-win-probability and see how far down the list he needs to go to get to 270. 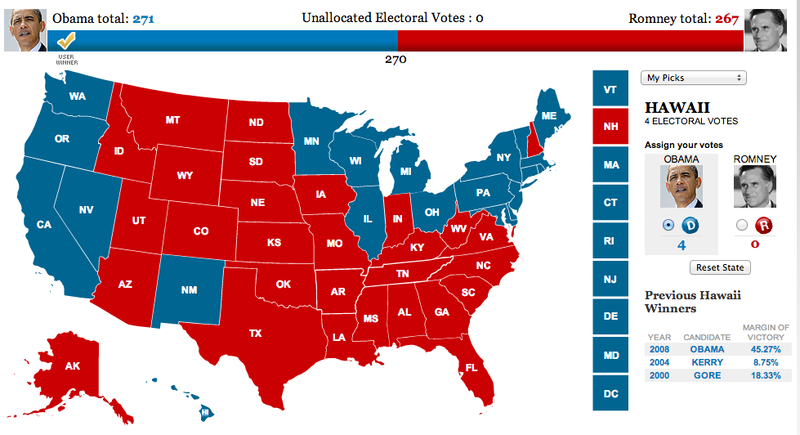 And the minimal Romney-win map looks the same with Ohio red. This is why you’ll hear Wisconsin, Nevada, Ohio, and sometimes Iowa described as “Obama’s firewall”. If he takes those states, he’s going to win even if he loses battleground states like Florida, Virginia, and Colorado. What to Watch For. So Romney’s path to victory is narrow and depends heavily on the east-coast states Florida and Virginia. Those are the ones to watch early. If Romney loses either one, he’s done. If either one is too close to call hours after the polls close, probably that means the national trend is not enough in Romney’s favor to crack Obama’s firewall. An easy Obama win in New Hampshire, on the other hand, is only 4 votes, but it might be an early indication of an Obama victory nationally. But if Florida and Virginia fall easily to Romney and New Hampshire is too close to call, we’re going to be studying specific Ohio counties far into the wee hours of the morning. I’ll analyze Election Night hour-by-hour in a later post. I’ve been working hard for a local candidate for the House so I really care about this election (not to mention that it will determine the path of the nation for the rest of my lifetime) but I plan to go to bed at my usual time on Tuesday night and don’t expect to find out who is president when I wake up on Weds morning. In fact I’ll be shocked if we are certain of who won on Weds morning. I’m getting two of you emails but I only need one. Can you fix that glitch? A. If you’re getting them through WordPress, I don’t think I can fix it, but you should be able to. Sometimes I have to edit a page after I post it, and then you’ll get it twice. I try to avoid that by proofreading closely the first time, but mistakes sometimes get through. The table is not right because the Romney numbers are shifted up by one block. I couldn’t decide how to do it. If I shifted the Romney numbers up, then I’d need to explain why they don’t add up to 538.